For a smooth, glowing skin it is important to give your skin a little pampering and rejuvenation every now and then. Having dry skin is not a serious condition but it can be problematic because it is usually accompanied by itchiness and scaling. 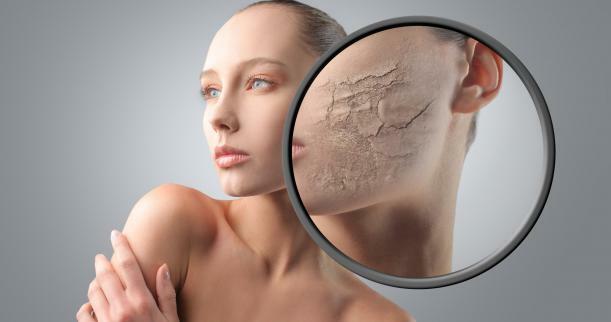 Chronic or severe drying of the skin may need dermatological attention, but most people will find that there are many home remedies for dry skin that they can initially try for themselves and find useful. • Take an apple, grate it or put it in a blender to get a smooth puree, apply it on the skin and wait for about 20 minutes. Wash off using cold water. Apple is an effective home remedy for dry skin. It contains potassium and tannin that are vital for maintaining the healthy texture of the skin. It removes the dryness of the skin and makes it appear shinier. • Take 2 tbsp of barley flour. Add 1 tsp of turmeric powder and 2 tsp of mustard oil in it. You can add some water to get the desired consistency. Apply this paste on your face and neck. Leave it on for about 10 minutes and then scrub it off gently with your palms in circular motions. Wash off with lukewarm water. Tone and moisturise as usual. • Take 2 mashed bananas and add 2 tbsp of honey in it. Mix well and then apply on your skin. Leave it on for 20 mins and then wash off with warm water. Tone and moisturise as usual. • Mix one egg yolk with 1 teaspoon of orange juice, 1 teaspoon of olive oil, a few drops of rose water and a few drops of lime juice. Apply the mixture to your face every morning for 15 minutes before you take a bath for a soft radiant skin. • Mix 5 tablespoons of cocoa powder, 4 tablespoons of honey and 2 tablespoons of mashed avocado. Apply the mask to your face and any other part of your body that you so desire. Gently massage the mask into your skin, leaving it on for 15 to 20 minutes. Then rinse it off with warm water. • Peel a ripe mango and squash into pulp. Mix 1 teaspoon of mango pulp with 1 teaspoon of sugar and use it to peel and prepare your skin for the actual mask that’s now to follow. It’s made of the rest of the pulp mixed with 3 teaspoons of argan oil. Apply it carefully and let it do its magic for 20 minutes. Wash it off and don’t apply any additional lotion afterwards. • Mix ½ cup of yogurt with 3 tablespoons of mashed-up papaya, and apply to skin. Leave on face for about 15 minutes. Wash off with lukewarm water, tone and moisturise as usual. • Soak 3 to 4 almonds overnight in half a cup of milk. Grind into a fine paste and leave to cool in the fridge. Apply on your face before going to bed and wash off the next morning to reveal softer smoother skin!